LG is launching its EA93, the world’s first 21:9 UltraWide LCD display. 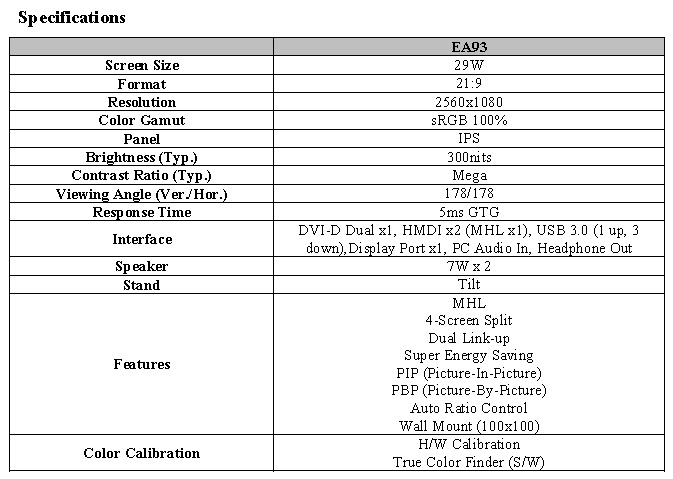 Using IPS LCD panel, the 29-inch monitor has 178/178-degree viewing angle and 100% sRGB color space. It features 2560×1080 high resolution, 300-nit brightness and Mega Dynamic contrast ratio. The monitor is hardware-color-calibration ready for showing true-to-life color. The EA93 is ideal for graphics professionals with its 4-Ccreen Split feature that can divide the screen into two to four segments for ultimate multitasking. It also includes Picture-in-Picture function. The display is also a good choice for playing games and watching movies, thanks to its lifelike color reproduction. You can find DVI-D, two HDMI (one with MHL support), DisplayPort inputs and a 3-port USB 3.0 hub. The 21:9 UltraWide display also sports built-in 7Wx2 speakers. The LG EA93 is wall-mountable. It features LG’s CINEMA SCREEN design with a super slim bezel.